Echo CS 590 vs Husqvarna 460: Which One's Best? Echo CS 590 vs Husqvarna 460: Which One’s Best? When the two toughest kids on the block take to socking each other in the jaw, sometimes the question of who wins comes down to a number. In the case of the Echo CS 590 versus the Husqvarna 460, that number is what’s on the price tag. If you are comparison shopping, we’re comfortable in advising you to go with the one that you can get at the better price, whether it be standard pricing, a sale, or a refurbished model from a reputable dealer. Right now, today, we’re lifting the CS 590’s hand in victory. Once the marketing is stripped away, both models have features that do basically the same things. They are nearly equal in power. Both are designed for user comfort and to reduce user fatigue. They are each designed for easy maintenance, fuel efficiency, and meeting the world’s strictest air quality standards. Above all, both saws chew through wood — hard wood — like a beaver on a birch tree. Because of that, both brands have their own partisans who swear by them. Let’s get into the details to get a better idea. The Husqvarna 460 comes with a slightly higher output of 60.3 cc, compared to the 590’s 59.8 cc. What does that mean in practical terms? Zero. On the other hand, both chainsaws are real goers. The Husky is a touch more skittish to get going, but once you have these saws roaring, they’ll make short work of trees and limbs all day. The CS 590 is really just Echo’s 600, but with some plastic in place of metal. In the long term, this might lead to some durability issues. In the short term, it didn’t cause us any problems. The 460 is a few pounds lighter than the CS 590, and neither saw had an edge in weight distribution. Both also come equipped with vibration dampening features and low exhaust emissions for better air quality. This means that over the course of a long day of cutting, the 460 might be less fatigue-inducing. The weight difference isn’t so substantial that you’d definitely notice it, so the Husky’s edge here is only slight. There is nothing complicated about this comparison. Echo offers a standard five-year warranty. Husqvarna has a standard two-year warranty for basic home use, which can be extended with add-ons at the time of purchase. It’s a simple case of numbers. In this case, Echo again has the better one. Husqvarna calls the super-efficient engine that comes standard on this saw the X-Torq. It does cut down on exhaust fumes. Echo doesn’t have a fancy name for its two-stroke engine, but it does roughly the same thing. The only significant difference between these two excellent chainsaws is standard shelf price. It’s enough of a difference that day-to-day variability probably won’t bridge the gap. What might, however, are discounts, rebates, and temporary sales. You also might be able to find a really good deal on a refurbished model or a showroom model that has been slightly dinged. Given the brands’ reputations, you might be a bit surprised to see the Echo CS 590 stack up so well against a similar Husqvarna. Brand loyalty might be a big deal right now, but what’s more important is whether the particular tool model is a good one. In this case, breaking down brand loyalty is healthy, because Echo definitely punches up with the CS 590. It’s an all-day performer with features designed for safety and efficiency and cuts anything you put in front of it with real nastiness. In Husqvarna’s chainsaw family, above the 460 is professional grade. The 460 is a premier large chainsaw designed to plow through large, thick hardwood. It does this with gusto. It’s big and angry and not at all designed for subtlety. Husqvarna has a reputation for quality chainsaws, and the 460 is a prime example of how that reputation isn’t just Internet bluster. The company delivers where it matters most: out doing work. After looking at both these saws individually ourselves, we checked online customer reviews to see how our experiences with these tools compared to the meta narrative. We found that both saws are very popular with people who bought them. Users that gave them low ratings were individual discontented customers who had difficulty getting saws running right out of the box, not long-time users with reviews based on actual use. As the rating figures suggest, it’s difficult to say that either model delivers substantially better satisfaction to its range of purchasers. The Echo CS 590 wins this contest based purely on one number: the current price. The two chainsaws are nearly identical where it matters the most, which is performance in the field. The Husky is a little easier on the user in terms of weight and probably a bit more durable, while the Echo is a little easier to start and has a better warranty. 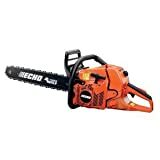 Both are very good chainsaws that have their own loyal customers. In this case, price wins out, and the price is high enough that we’d suggest doing a little shopping around. It’s possible that you can put together a discount package that tips the scale the other way, too.